In a celebrity-obsessed culture where fans infect themselves with viruses from their idols, Syd March must discover the origins of a deadly new strain that threatens his life. Syd March is a technician at The Lucas Clinic, a medical facility that infects its celebrity-obsessed clientele with diseases and afflictions shared by famous contemporary icons. Edward Porris is a fan of Hannah Geist, with whom The Lucas Clinic has an exclusive contract for selling her illnesses. Syd sells Edward a strain of Hannah’s herpes and injects him with the virus. The celebrity illness industry utilizes a proprietary machine called a Readyface console to assign warped human faces to each virus strain as a form of copy protection. Syd hides one of these consoles behind a secret wall in his apartment where he undoes the copy protection to sell viruses on the black market. After serving a client, Syd secretly injects himself with a virus from celebrity Aria Noble. He then goes to see his black market contact Arvid at a meat shop that sells celebrity essences as food products. In a back room, Syd attempts to make a deal for the new Aria Noble flu, but Arvid already has it. Back at the clinic, Syd learns that fellow technician Derek has been arrested for smuggling viruses to the black market. A Readyface console was discovered by the police in Derek’s apartment. An inventory check at The Lucas Clinic reveals that a second console is missing, which is the one that Syd has. With Derek no longer an employee, Syd is sent on a house call to a hotel where he is to retrieve the latest Hannah Geist virus. Syd collects a sample from the ailing celebrity and then injects himself with the virus in a bathroom. Afterwards, Syd’s health gradually worsens. Working with the virus fries his Readyface console. Syd learns that two men came looking for him while he was unconscious in his apartment from the illness. When he regains consciousness, television reports claim that Hannah Geist has died from her latest sickness, which she reportedly contracted while she was in China. Syd asks Arvid about Hannah’s death and for help repairing his console. Arvid asks if Syd has Hannah’s latest virus, but Syd claims that he does not, despite his sickly appearance. Days later, Arvid takes Syd to see his underground contact Levine for console parts. While there, Syd discovers that Levine is working on a form of celebrity simulator. Arvid and Levine try to negotiate an exchange of console parts for the Hannah virus that they know is in Syd’s body. Syd refuses, but he is knocked unconscious when he tries to leave. Arvid and Levine then take blood samples while Syd is restrained. Syd wakes on the street and goes to a nearby diner. The two men who searched for him at his apartment find Syd at the diner and force him to come with them. Syd is taken to meet Dr. Abendroth. At this mansion, Syd discovers that Hannah Geist is still alive. The pathogen that infected her was determined to have been specifically manufactured to assassinate her, but it did not succeed. Rather than risk another attempt on her life, Hannah’s managers told the media that she died. The virus killing Hannah and Syd was developed from a strain that had been previously sold to The Lucas Clinic. Geist’s team needs Syd’s help to find a cure. Syd returns to work and learns that Derek Lessing was the person who last accessed Hannah’s Bermuda flu that was used to create the new pathogen. Syd tries to take Arvid hostage, but his sickness allows Arvid to overpower him. Syd finds a vial hidden in Derek’s apartment. Back at his own apartment, Syd is delivered a package from Hannah’s team with the parts to repair his Readyface console. Syd discovers that Lucas Clinic rival Vole and Tesser created the virus intended to kill Hannah. Vole and Tesser agents kidnap Syd. Levine now works for them. As his condition continues to worsen, the rival clinic harvests samples from Syd to sell to Hannah’s fans. In a moment of distraction, Syd puts a needle into Levine’s mouth and escapes the clinic. Mira Tesser later contacts Syd and asks him to continue collaborating with Levine. Syd refuses. He also realizes that even though The Lucas Clinic has exclusive rights to Hannah Geist’s viruses, Vole and Tesser patented the virus that Derek put into her, making it their property instead. Mira agrees to meet with Hannah’s team about collaboration, but after seeing Hannah’s terminal condition, she refuses to help Hannah or Syd with a cure. Instead, Syd, Hannah’s team, and Mira make an arrangement to keep Hannah Geist in a vegetative state where they inject her with new viruses that they sell as part of a Hannah Geist Afterlife line. David Cronenberg made a mark in the genre with his exploration of body horror themes including physical transformation and transmogrification. Now, progeny, protégée, and prodigy Brandon Cronenberg follows in his father’s footsteps while managing to sidestep the man’s shadow at the same time. These sentences will be the last time that this review mentions the familial connection. Because despite thematic similarities with the senior Cronenberg’s body of cinema, Brandon Cronenberg is clearly a talent deserving of recognition for his work and not for his parentage, and his film stands on its own. 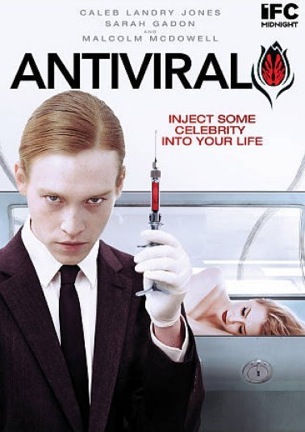 Celebrity obsession was only the first way that society in “Antiviral” was transformed. So thoroughly hypnotized by famous personalities is the general population that dressing and living like their favorite icons no longer fully satisfies. The hippest trend is now to inject one’s self with the same cold, flu, or STD that afflicts the rich and famous. Red carpet questions in the real world ask, “who are you wearing?” Within the following week, housewives and soccer moms take their People magazines and purchase knock-off designer dresses to emulate celebrity style. “Antiviral” instead asks, “what do you have?” Illness is the hottest commodity, and afflicting the masses with trendsetting ailments is big business. Syd March is a technician at The Lucas Clinic, a company that gives its healthy clients what they want: sickness. Lucas has an exclusive contract for the pathogens of Hannah Geist, perhaps the hottest female celebrity around. Syd has a side business of undoing the copy protection on patented viruses and shepherding them onto the black market. But he uses his own body to carry the merchandise. And when he injects himself with the same illness that later kills Hannah, Syd has to find a cure before he suffers the same fate. Through crisp cuts between static camera shots and a deliberately Spartan production design, “Antiviral” establishes its consuming atmosphere immediately. Simple, chic, and elegant, omnipresent white walls and slim lined architecture wash the world in stifling sterility. It has the subconscious effect of confining the audience wholly within its walls, afraid to move or otherwise spoil the hospital-like tone. Depictions of mouth sores and bloody infections are more skin crawling as a result of immersion in an obsessively clean environment. “Antiviral” is comfortable with its sleek and unique styling. Glamour is portrayed against stark and open backdrops. The world consumes food that, no matter its shape, is still formed from the same generic mass of tofu beige Play-Doh. Even character names have their own distinct flavor on the tongue: Hannah Geist, Aria Noble, Vole and Tesser. The film is confident enough to move at its own pace. Its movements are not forced by scriptwriting formulas or typical film trappings. The deliberate slowness is precise to a point, but once the perpetual mood of “Antiviral” is ingrained in the mind, the slowness becomes more noticeable. So acclimated does one become to the atmosphere that the runtime starts to seem mildly oppressive in the latter half of the film. There is also an issue with Syd’s relatability. Actor Caleb Landry Jones has the sickly glow and brow peering stare of the character down pat. He is as overwhelmed by the domineering atmosphere as the audience. But his ongoing lack of reaction and the missing insight into his motivations puts up a frustrating wall that makes his identity inaccessible. Yet while there are mild issues with the structure and characterizations, categorizing the film as effective would still be an understatement. “Antiviral” is neither a gross out nor a jump scare fright film. “Antiviral” is under the skin body horror. Those who cringe at the sight of needles penetrating skin will turn their heads away multiple times throughout. And those who are fascinated by fresh concepts and unique ideas will have numerous occasions to stare in wonderment. This is the first feature that every filmmaker wishes s/he could make. “Antiviral” is not a grand slam, but it is a resounding crack that announces Brandon Cronenberg as an interesting new voice in the genre. June 30, 2013 by Ian Sedensky.